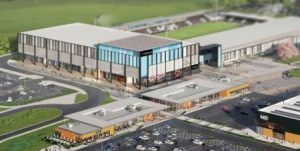 Marlborough has secured a £950,000.00 package to build the new York Stadium and Leisure Complex for Main Contractor Buckingham Group. The package, which includes supply and fix brickwork and blockwork will start in July 2018 and will complete in December 2018. The work comprises 28,000m2 of concrete blockwork and 200,000 facing bricks and will continue Marlborough’s strong growth in the city of York and the Yorkshire region. The scheme will include an 8,000 all seater stadium to be shared by York City Football Club and York City Knights Rugby League Club and new community leisure facilities, including newly improved swimming facilities, gym, dance studio and a sports hall with spectator seating. The scheme will also house a wide range of community facilities, catering and hospitality venues and family leisure activities.